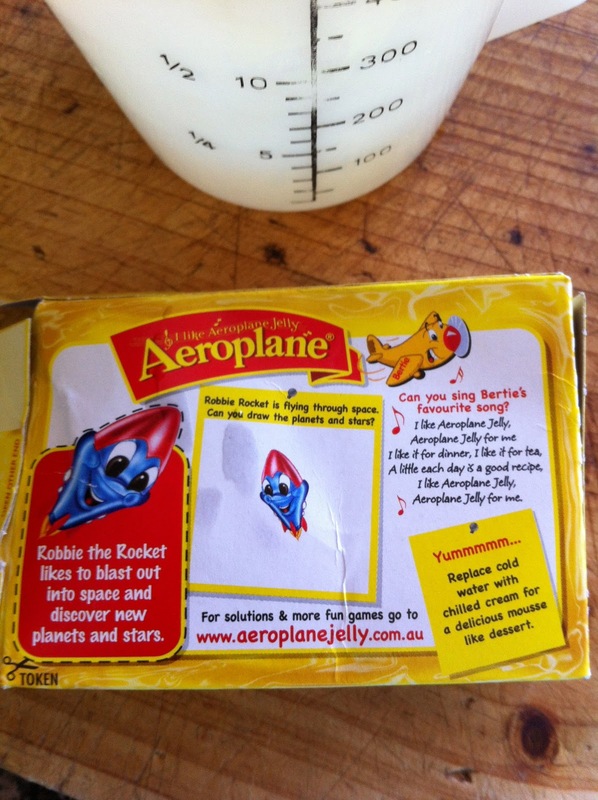 When I arrived in Australia in 1976 I remember Aeroplane Jelly ads on the TV some of which were still in black and white. They had the ditty and music that went along with the product that all the kids seemed to know - good advertising eh. Over the years I must have made tons of jelly for my own kids growing up, but I haven't had jelly for years but when I do taste it the memories of childhood floods back - mum would always make fruit and jelly for "afters", or her version of trifle with sponge in the bottom of a glass bowl set in jelly, fruit and cream. 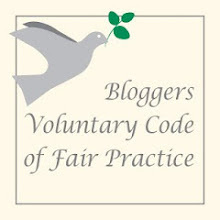 However, I have eaten a fair bit of jelly in the last 24 hours due to the fact of a fasting period in preparation for an unmentionable medical procedure! 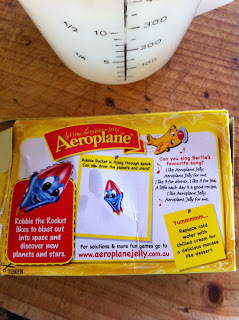 I turned to the tried and true Aeroplane jelly for my fasting sessions still with the little plane Bertie on the front of the pack. There is also a little snippet of history on the box too. 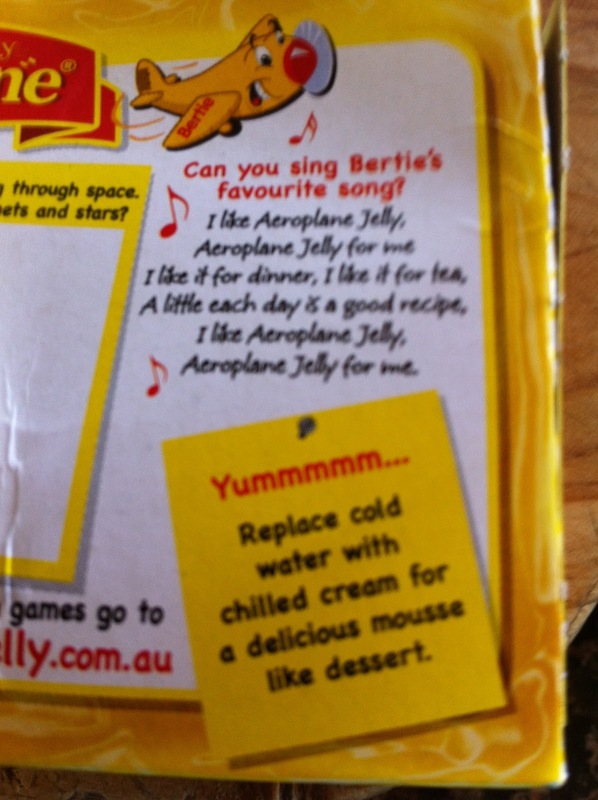 Bertie the aeroplane is named after aeroplane lover, Bert Appleroth, who created the delicious Aeroplane Jelly back in 1927. The little song is printed on the back. 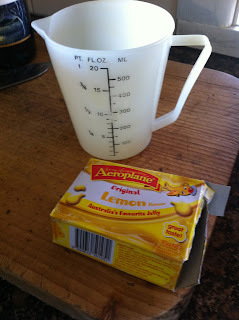 ( I have to admit I had a little sing to myself as I boiled the water). So my lunch, dinner and supper took no time to make with a little boiling water, popped in the fridge and ready for consumption. I have enjoyed it so much I have stocked my cupboard with these little boxes of crystals to pull out and make when the little ones come for a sleep over. Not on the diet but considering it. Hope everything is ok. Your jelly looks fabulous, I love the retro packaging. Thank you Jude - all well. 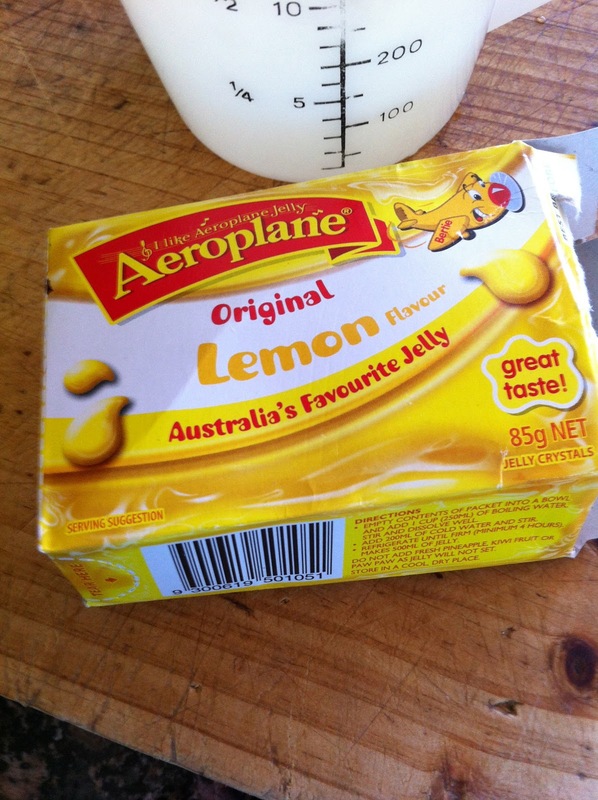 Isn't the retro packaging fun? 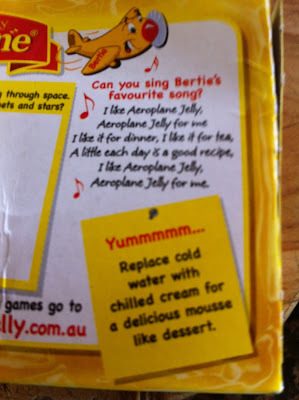 I couldn't remember the song until I saw the words on the back of the packet - had a little sing to myself (in my head). Glad all is well - forgot to say in my email. 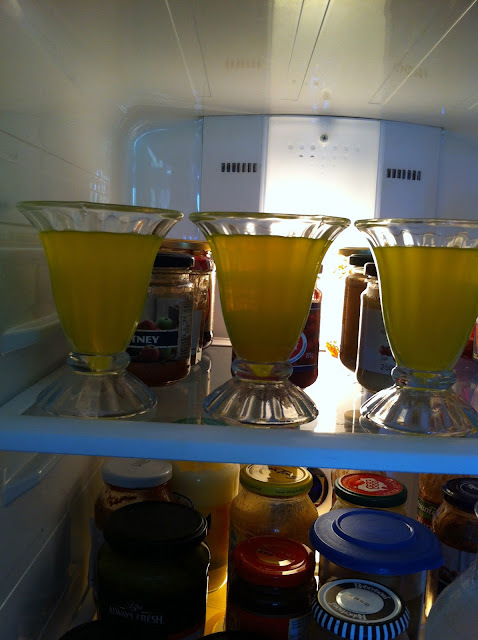 What's the significance of jelly when fasting? I always thought nil by mouth meant just that. Three days of graduated fasting, no carbs grains or food containing fibre on the first day, second day Jelly and fruit juice or clear broth. Third day nil by mouth! This cake took the cake on Australia Day!